Here's a few belated snippets of our Christmas holiday fun. It was almost a little strange this year having a couple of extra days before Christmas Day - usually we'd only have one or two at most. But in the meantime, we enjoyed just hanging out together at Nana & Poppa's especially with Nic and Kim there. 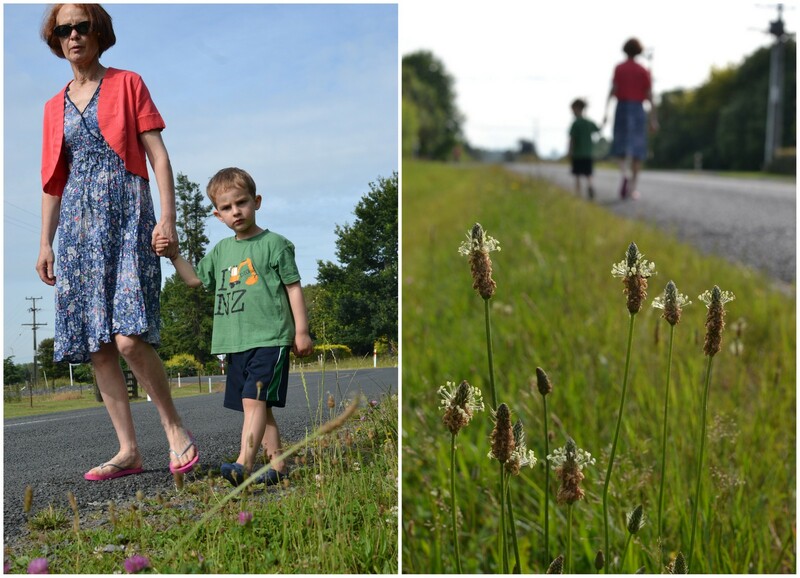 There were country walks in warm sunshine. There were blueberries to be picked with Poppa. And as always, rides on his mower. There were stunning sunsets to sit and enjoy with a cold beverage and great company. And then there was Christmas. Presents and party poppers galore. New books to be read. New games to be played. New skills to be learnt. I also made my favourite Christmas treat, mulled wine, again (despite not really being able to have more than a glass with my silly funny tummy) and it went down quite a treat with everyone. It's definitely becoming a tradition. After a yummy evening meal and with two little people finally tucked up in bed, all the big boys threw around Mark's american football, while us gals played petanque all around the field enjoying the warmth that was Christmas night. It's been a funny kind of holiday for me this year, usually I'd have taken a zillion photos of our holiday antics and posted every other day. But I really haven't felt like it this year. I've spent a good part of the holiday feeling pretty yucky with chronic diarrhea (that is ongoing and as yet unexplainable as I'm pretty sure it's not a bug), and so I've slept and rested a lot more than usual. We also haven't tripped around the countryside as much as other years apart from a wee nature walk on Boxing Day and I haven't felt like I could cope with lugging my big, heavy camera bag around the place either. So a very different kind of Christmas this year. Don't get me wrong, it's still been fantastic with amazing family moments with all us kids and partners together under Nana and Poppa's roof, but for the most part it's just been about enjoying being together instead of documenting each and every moment for posterity! Loving my new iPhone cover that I spotted via Pinterest, bought on Etsy and then snuck it into my stocking this Christmas. Quite possibly the coolest cover ever. Loving the extremely cool set of Christmas nails my colleague Jade painted for me on the last day of work. She is an amazing talent when it comes to nails, and does her own free-hand designs on her own nails as well, and with a collection of over 100 nail polishes, she has a good few to choose from. I was so impressed that I managed to keep these nails looking half decent until Christmas Day. Can you work out what they all are? Santa, candy cane, snowman, holly and a Christmas tree with lights. Loving receiving an early Christmas gift from a friend who knows me so well last week. Tracey was my original Scrabble buddy back in the day when we used to play with an old-fashioned Scrabble board, before the days of Scrabulous on Facebook and more recently Words with Friends via the iPhone. She is a total Scrabble fiend and usually beats the pants off me. So this was a very appropriate gift to get from such a lovely gal! Cutest reindeer in the world. Period. I know Christmas is over. Alright already, I hear you say! But this totally delish set of deer that my colleague had on her desk at work had me drooling all over them. And when we added some cute little antlers they turned into the sweetest, cutest reindeer in the world. Period! Anyone heard of and love this band? Discovered them properly a couple of weeks ago and am really loving their album. Here's their most well-known song Little Talks. What things are you loving these holidays? So our wee elf Eddy did finally turn up (better late than never!) and we have been having all manner of fun with him. We have taken a slightly different tack with our Elf preferring to tie in the grace of Jesus and His love than Eddy being sent to keep an eye on whether the kids are 'naughty or nice'. We wrote a special letter from Santa to the kids explaining about Eddy and why he is visiting the kids this Christmas including how we all are naughty from time to time and need God's forgiveness, even naughty elves. Day 4: Kiwi and Eddy knuckle down for an intense game of Connect 4 Advanced. Who's gonna win? Day 5: Oh no! Star Wars baddies have taken Eddy hostage! Day 9: Eddy makes himself a flying fox and swings his way to the Christmas tree hanging onto a candy cane. Then tonight when Santa comes to drop off the presents for the stocking, he'll be taking Eddy home with him to the North Pole until next year. This is the letter he's going to leave for the kids. Ho ho ho, if it isn't two of my favourite little people! Thank you so much for looking after Eddy for me. I hope that you were able to show him God's love during his visit and help him learn about how Jesus gives us his grace each day. Eddy and I have headed back to the North Pols now but I know that Eddy would love to visit you again next Christmas if you want him to, so I'll be sure to send him back to you then. I've left you both some wee presents in your stockings as a thank you for being so kind and showing God's love to Eddy when he came to stay. I hope that you both enjoy your gifts with all my love. And last but not least, for a little bit more elvish fun, we Jib Jabbed ourselves. These videos are always good for a laugh! Other than a quick Things I'm Loving post scheduled for this Friday, there's likely to be less blogging going on over the holidays, but if you are on Instagram you can keep up with our holiday happenings by following me on meghanatmnms or via posts on Facebook here. Have a truly BLESSED Christmas! 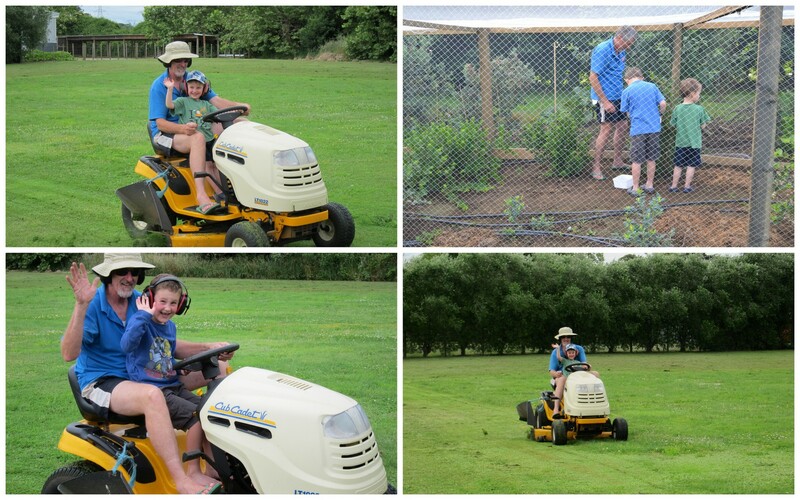 Despite the fact the weather forecast is not looking too flash for the next week, we have so far been enjoying the warmth and wide open spaces of the Waikato, getting outdoors while we can. Daily (if not twice daily) bike rides are usually the order of the day while we're here. I have such cleasr memories of Noah at the same age (he got given the running bike for Christmas when he was 3) zooming up and down this long stretch of road. And it feels as if time has warped forward, now seeing Mylo's little feet flying over the same patch of ground as his big brother did. I felt compelled to wear the gazinnias the boys so lovingly picked from the garden (sorry Poppa, I'm not sure you necessarily would have approved of those little fingers picking them had you known!) on our walk. I always breath a sigh of relief when we finally drive up the driveway on our arrival here. The annual pilgrimage to Nana & Poppa's for Christmas is not for the fainthearted, being a 7-hour road trip with a couple of stops for coffees, wees (some more unscheduled than others! ), and lunch on the way. We get on the road bright and early at 6am, and always try and make it as far as Ohakune (3.5 hours) before stopping for coffee. After that the stops seem to get closer and closer together the further on we go! I so love stopping at The Mountain Rocks cafe for coffee, the decor is so quirky inside. And that little interlude was followed by 'quirky' outside with a lady strolling up and down the main street of Ohakune in pink pyjamas and gumboots - only in NZ! The best sight of the trip though - this totally over-the-top laden down trailer with everything AND the kitchen sink on it. We did our best to pass it as soon as possible, so as not to be the ones who caught a flying scooter or baby safety gate in the middle of our windscreen! The boys made themselves at home as soon as we got to Nana & Poppa's, Mylo entertaining us all by pouring everyone their favourite hot beverage from Nana's antique kid's tea set which we calculated must be not far off 60 years old. I have so many great memories of playing with it as a child too! This year, for the first time, Nana & Poppa have splashed out with a real Christmas tree, and an 8-footer at that. I was unusually pooped last night when we arrived and just enjoyed lying on the couch watching the phases of multi-colour lights as they twinkled and danced their way through the evening. Mental note to self: I am definitely getting myself a better set of lights for next year, they are quite mesmerising and therapeutic. And now we await the arrival of Nic and Kim from Melbourne, due any minute. And then Christmas celebrations can really get underway! I organised for our Corporate team to go out for a curry and bowling night as an end-of-the-year wind-up, and most of us did a Secret Santa. Mine was totally random but cool at the same time. A giant rubber ducky, who we renamed Jemima Puddleduck to be our team mascot for the bowling. She also looked super cute wearing my sunnies, don't ya think? I love the fact that Telecom have such a cool tradition at Christmas, lighting up Auckland, Wellington and Christchurch with separate trees each year. And the fact that you can design your own display to be shown on the tree at a particular time is even cooler. I took Noah down to see it as a special treat last weekend and we enjoyed lying under the tree looking up at the changing lights listening to the sounds of Christmas blasting out on the speakers all around us. Here's a wee clip of the fun we had. I think you can tell how much Noah loved his special outing with Mum too. 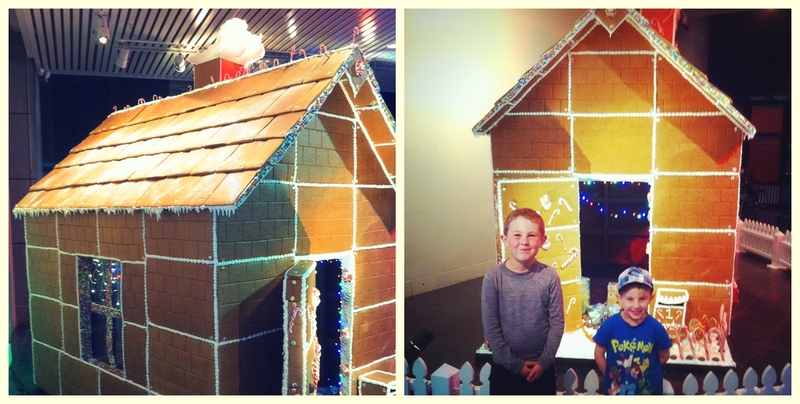 The chef at Te Papa has created an amazing lifesized gingerbread house which we visited the other day. It took 180 hours of baking and who knows how many cups of flour, but lordy it smelt divine. Hard not to jump the fence and dive into it. Happens every time we got to Te Papa. Amongst the big air jumps they always make time for some pebble angels. Love these 2 pickles to pieces - even with all the pebbles that come home in various pockets and other orifices afterwards! Loving the warm weather last week. Warm enough for our first outdoor dinner - and what better dinner than the one the that gets gobbled up the fastest at our place? That Spag bol went down singing hyms! Last week I had the coolest experience doing a cupcake decorating class for 2 hours. I got to play with all kinds of molds with the fondant icing and got shown various techniques and cool tricks like using rainbow dust and glitter to zhush up the decorations. I especially enjoyed making the snowflakes and holly. Not wanting to dumb down the difficulty of it all, but being a mum with young kids, it felt a lot like I was just mucking round with playdough! I can definitely see more fancy cupcakes in my future now I know how fun and easy it is! Loving the fun of Angry Birds being taken to a whole other level with the new Star Wars version. Each level is a different Star Wars character who does different things, Obi Wan-Kenobi uses the Force, Luke Skywalker uses his lightsaber, Hans Solo uses his gun. The kids are ALL over this at the moment. Today is the last day of work for me for a good 2 and a bit weeks. Yeeha to that! We're heading up to Nana & Poppa's bright and early tomorrow morning, and so looking forward to seeing them as well as hanging out with Sam and Alesha, Nic and Kim. I can't wait to be in the warmth of the Waikato and in the wide open spaces of the country. Whether you are having a traditional cold Christmas amongst snow and dark evenings, or you're like us enjoying a cold beer and putting another saussie on the barbie in the heat of the summer sun, I hope that you all have a very blessed Christmas and that you're able to reflect on and remember the real reason for the season. Jesus, a Heavenly Saviour born in the most unexpected of circumstances, yet still the King of Kings who changed the world forever. And that is such a nice segue into this year's fantastic clip from St Paul's shown at Vector Arena's Carols by Candlelight in Auckland last weekend. And one of my very talented bloggy friends wrote this story, can you believe it!! Simone, thank you for creating this most amazing and unique insight into the Nativity story. Our world is truly a more blessed place for it.